The easiest way ever to learn Quran vocabulary! Get the App now, it's FREE ! Use the method of memorisation by spaced repetition to revise at the right moment, in order to learn without forgetting anything. Your planning is generated automatically. Learn the words that are more often repeated. That is less effort for more results. Use the MCQ (multiple choice questions) and key entry for a fun and interactive learning and to stimulate your visual memory. The learning is supported by a professional that recites the words in order to solicit your auditory memory and improve your pronunciation. 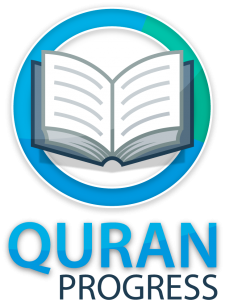 Quran progress is a web application that aims at simplifying the learning of Quran vocabulary. 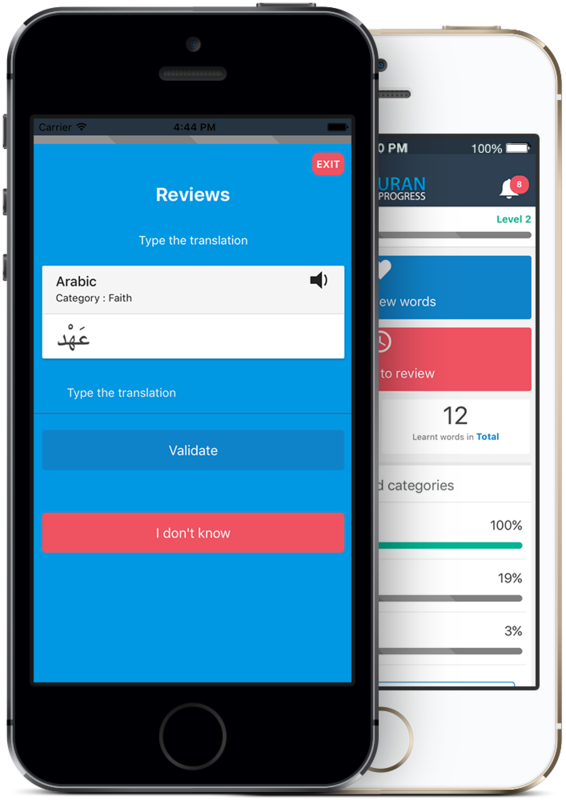 On one hand, this application aims at assisting the non Arabic speakers and beginners in their efforts to memorise Quran – As it’s well known that people memorise better things they understand – and on the other hand, the application seeks to improve the global understanding of the explicit meaning of Quran verses at listening or meditation. It uses a highly effective memorisation method, called spaced repetition, which has been demonstrated by renown scientists. It maximises efficacy of learning, as i helps learn the maximum with minimum efforts (see below). 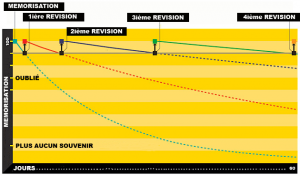 What is memorisation by spaced repetition? -When we learn a word without revising it, the word will be destroyed from our memory. -In contrary, forgetting is seldom complete, so when we learn again what we have already leant, we forget less rapidly. – If we revise a word that we are about to forget, we will need less and less to revise it again. The spaced repetition method will identify the words that you find difficult, and those with which you are more at ease. It will organise accordingly your learning in such way that you will revise at the right moment. Have organised revisions, with the perfect timing that allows you to exert less effort for maximum results. Gain time, and revise words in a proportional fashion to your difficulties. Have no worries about planning your revision: Quran Progress does it for you. How to learn as much Quran vocabulary? Quran is composed of nearly 80’000 words. Statistical studies demonstrated that only 4000 unique words are used among them. This is explained by the fact that plenty of words are repeated throughout Quran. For example, the word “Kitab” (book) is repeated 200 times in Quran. If you understand the words of the surah Al-Fatiha you will understand 10% of Quran. There are 125 words that are repeated more than 40’000 times. The mere learning of these words equals to nearly 50% of Quran. And if you learn additional 125 words this percentage will increase to 75%. There are 200 verbs that are repeated more than 18’000 times in Quran. Additionally, who else but Allah could be more credible to prove us that Quran was made easy? [Surah 54 Verse 22]: And indeed, we have made the Quran easy for meditation. Be there anyone that will reflect? [Surah 54 Verse 32]: We made Quran easy to understand, to serve as a reminder, and then, is there anyone that will meditate this reminder? These verses prove us that Allah, with his mercy, has made easy the understanding of Quran. It’s now our turn to make cause in order to understand it. Therefore, Quran Progress comes here as a tool that helps you understand these words, in an unprecedented, performing and efficient manner. Quran progress is based on the work of Abdul Azeez Abdurraheem for the words’ selection, and Al-Lawh team (Facebook link) for the translation of the words. They made a stunning work for the community.